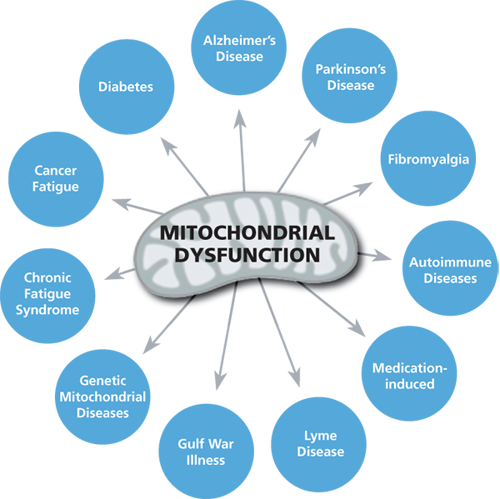 There is a steadily growing body of evidence linking many adult-onset diseases, including fibromyalgia, Chronic Fatigue Syndrome, Alzheimer’s disease, autoimmune diseases, and even diabetes, to a single common cause, referred to as "Mitochondrial Dysfunction". Mitochondria are the “energy powerhouses” of the cell. They burn the food we consume and generate all the energy our cells need to function. It is a proven fact that as we age the mitochondria's ability to produce an adequate amount of healthy energy begins to decline. Factors such as stress, poor nutrition, and exposure to toxic chemicals in the environment have all been shown to accelerate this process. As mitochondrial energy production progressively declines, the genetic makeup of a given individual determines which organ system will break down first. In other words, a person’s "genetic weak link" determines which disease they will ultimately develop. However, it’s the progressive loss of mitochondrial health over time that fuels this process. Part 2 - Can Failing Brain Cells Be Rescued in Alzheimer's Disease? Part 1 - Mitochondrial Failure: The Root Cause of Alzheimer's Disease? © 2019 Hope For Fatigue. All Rights Reserved. This website is presented by K-PAX Pharmaceuticals, Inc.